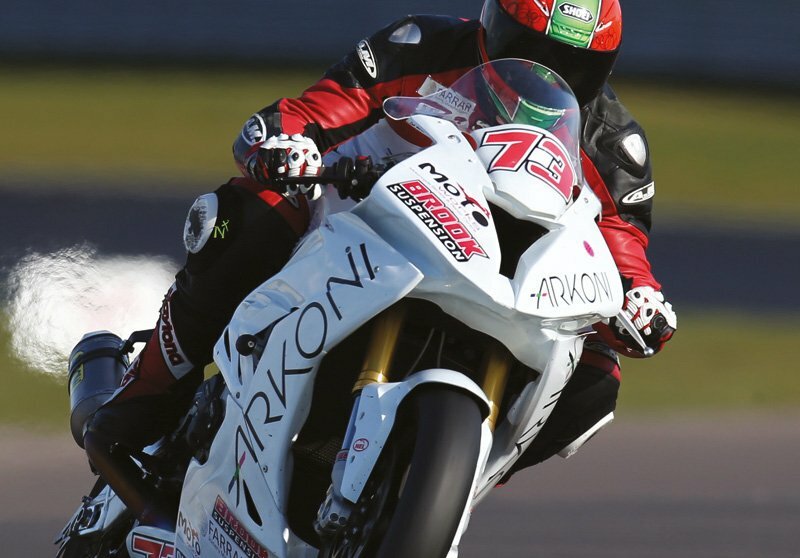 The Team Arkoni Racing rider is still working on his recovery following the huge crash last August, where he suffered a badly damaged leg requiring several operations and left him fitted with a cage which wasn’t removed until January this year. Despite missing the latter half of the year, Brook still ended 2017 in third place overall in Thundersport GB’s flagship GP1 Elite Championship. Currently battling his way back to full fitness, Brook was able to line up in the championship’s opening round at the iconic Leicester track, where he scored three strong points finishes. After qualifying his Team Arkoni Racing BMW in 13th spot for the first race of the season, Brook rode a careful but solid race to finish 13th. Under the Mega Laps system, he then lined up 16th on the grid for the second and third races. Consciously doing his best to avoid any more injury, he built up his race pace over the weekend, finishing his second race 12th and then making up a number of places in the final scrap to finish 10th. “I was pleased with how it all went, considering I ‘m still recovering,” he said. “We were lucky enough to take the Team Arkoni Racing BMW out to Spain for some testing a few weeks earlier, but the weather wasn’t great and I only managed to get one dry session in three days. “I had another operation in between that and the first round, so I didn’t get any more bike time until I arrived at Donington Park, so I was okay with qualifying 13th. Having banked a solid haul of points from the first round, Brook is now looking forward to the rest of the year, as he continues to get stronger. “Considering I’m so soon out of surgery, I really can’t complain. I’m just glad I’ve been able to make it back so quickly and my leg felt almost comfortable which was great. Founded in 1991, Arkoni supplies the construction industry with a full metalworking service, from design all the way through to installation. Based in Brighouse, West Yorkshire, the firm manufactures a range of products, including fire-rated and security-rated glazing and doors, bespoke steel glazing and architectural metalwork covering staircases, balustrades, balconies and other work. Having been a sponsor of Brook for four years, Arkoni managing director Mark Prentice is delighted to see him back in the saddle. “Dave was unlucky that his season ended when it did last year, particularly as he was challenging for the championship at the time,” he said. “But it’s fantastic to see him back out in action so soon.